In a few days time, my Tedx talk all about how you live a bigger life will hit YouTube…eeeekkk. If I am being honest before I got into running around 15 years ago, marathons were not even on my radar…I’m not sure I had even watched one on the TV…I sure as hell didn’t know anyone in real life who had run one. So why did I run my first one back in 2012? I was asked that question yesterday in a podcast and I have been thinking about it ever since. Why do people increasingly have this desire to run 26.2 miles? All in one go???!!!!! Because come on let’s face it it isn’t an easy feat, it’s mentally and physically challenging, it takes up all your time AND MONEY, it plays havoc with your body (bye bye lovely toes) and it seriously causes more stress that seems bearable at times. Yet people new to the distance sign up in their droves despite knowing all of this. Now you might be reading this and wondering yourself if running a marathon features in your near future? You may be in the ballot for the London Marathon…or you may be thinking about signing up for a Spring 2019 marathon elsewhere in the world. So to help you make a decision one way or another I have pulled together 5 hard to ignore reasons to sign up for your first marathon…NOW!!! Perhaps you are someone who has been naturally progressing from distance to distance, building in confidence, taking on new race distances and making steady improvement. Maybe you have a few half marathons under your belt and know deep down that the 26.2 mile distance is the next thing to try. Never feel pressured to make the jump from half to full, but know that actually most of the hard work has been done if you can run a half marathon, and by that I mean you have already shown a commitment to the sport, and already have a lot of the training and race logistics and know how under your belt. I have found that when I jump from half marathon to full marathon something switches in my mindset towards training. 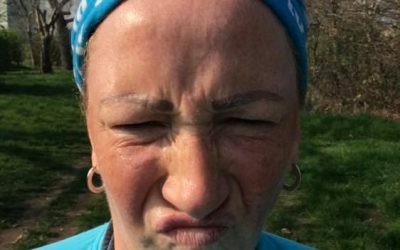 I turn up to training sessions, I run with others, I take better care of myself…because a half marathon you can kind of blag, but a marathon you absolutely can not. So if you are looking for a kick up the backside to take your running more serious…this could be it. Perhaps you have come to running later in life (hey don’t worry…us women improve with age at this distance apparently), or perhaps you are planning to have a baby, or about to embark on a career change, or are in great shape and hungry for the challenge or perhaps you are about to move to a different continent and everything is about to change. When planning for a marathon it always makes sense to look at your current circumstances to review if now is a good time to commit or not. I am so glad I made the decision to run my first marathon when I did because even though I was involved in a really hectic job the following year my baby daughter was born, and I seriously do not think I would have caught the running bug afterward. Running my 2nd marathon when she was just over a year old was good timing too, as it helped me have something that was just for me at a time where I was struggling with my new identity as “Mum” and still had childcare to enable me to do it. It has become much more of a juggling act since then. Don’t get me wrong there is never a perfect time to train for a marathon as most of us have to juggle other life commitments, but ask yourself if I don’t commit now will I ever? And if you don’t will you be kicking yourself in years to come? This is a great one for motivation. Women who show little interest in running a marathon all of a sudden become the most driven when there is a cause they believe in passionately. This could be about raising funds to support a hospice that cared for loved ones, or to cope with a recent diagnosis of a certain condition. But remember it doesn’t just have to be about money it could be about raising awareness and helping everyone affected have something positive to focus on. There are supplementary benefits to running for a cause. Now, this is a tricky one which may seem a bit controversial at first, but I wanted to include it because I think it is important that I am honest and upfront about the role of signing up to big fitness challenges in keeping me healthy. I have always said that if I didn’t have a race to train for I would never run. The fear of having a race coming up not only helps me to train, but also to focus on nutrition, and stretching and crosstraining. 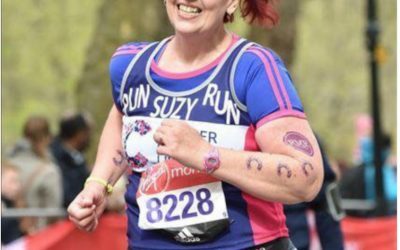 After having my daughter and putting on 4 stone in weight and losing all of my fitness, I knew the only thing to focus my mind was to sign up for another marathon…and it worked. There is a caveat to this though. Weight loss is not the be all and end all when it comes to health, for me my cardio fitness, flexibility, strength and mental health are all part of this process too…it is not a matter of lose the weight by any means necessary. Crash dieting…nope. But mindful fuelling…yes, please….and learning to really tune into your body. Weight loss is not a guarantee when it comes to marathon training anyway unless nutrition and mindset are well considered too. What I do know, for anyone reading this and wondering if weight loss is even necessary…well only you can make this call. 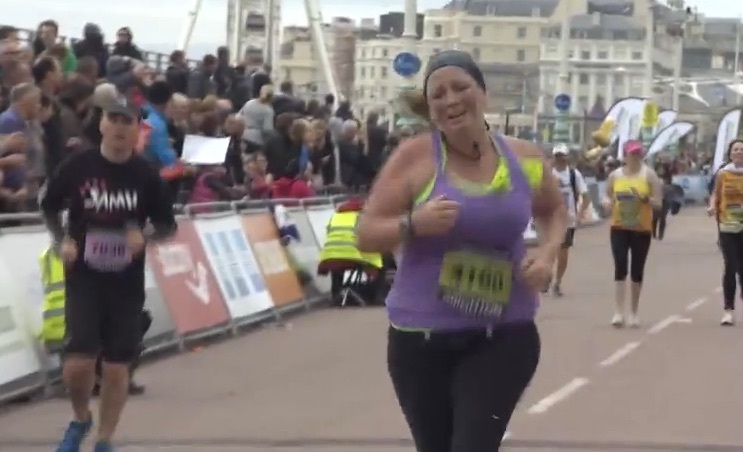 I write more extensively about this in my book The Fat Girls Guide to Running, because I think there is somewhat of a misunderstanding regarding my views on this. I do not believe ANYONE could or should run a marathon. A marathon is a major challenge that needs to be respected. Basic science dictates that the lighter you are the less impact it will have on your body as you travel the 26.2 miles (not forgetting the hundreds of miles in training). It will also have a major impact on the time it takes for you to get around, and your enjoyability of the race. My times and size at marathon races…. If you are serious about making changes to your lifestyle and habits and using the power of marathon training to make these changes, then why not give it a go? 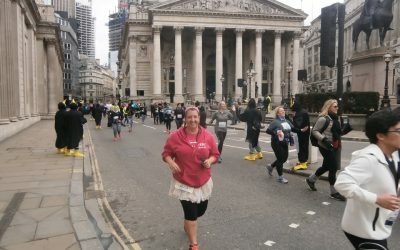 Lots of people want to do London…like it is the only marathon worth doing in the UK…but trust me having taken part in lots of races all over the world, try to think more broadly and perhaps tie it into some other kind of adventure or experience. the more you make your race significant to you the better. Perhaps tie it into a milestone birthday or to celebrate being cancer free, or to remember a loved one…or to prove someone wrong. 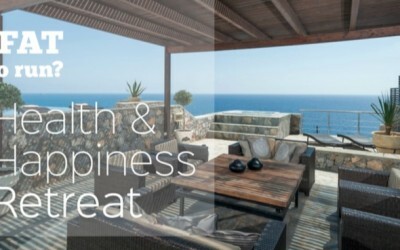 When it comes to Big Fat Stupid Goals you want to think about how this will help you grow exponentially, how it will change you as a person, what supplementary benefits you will get, and really start to visualise how you will feel once you accomplish it. As runners we decide to train and run marathons for many reasons, it is what I love about lining up at the start of a big marathon…everyone has their own story. But one thing I would say is, despite our solo (and maybe even quite selfish) reasons for doing so, do not attempt to embark on this journey by yourself. 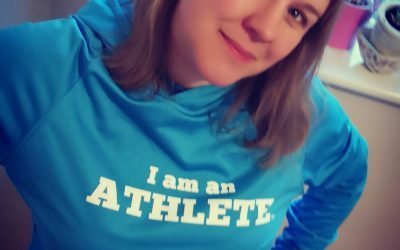 Get yourself a coach – I have just taken on a coach to oversee my training for NYC marathon and seek out support, advice, and accountability to support you through what is set to be a challenging, frustrating, yet enlightening time. Let me know, and give us a shout if you need some help along the way. On September 1st I will open the doors to my annual Spring Marathon Training programme. A programme which has seen me coach and supports more than 100 women so far to run marathons around the UK and further beyond. Hosted in a closed FB group the programme will have weekly accountability, themed coaching, guest experts, group calls, downloadable plans and templates, a training plan clinic, in-person training days and meetups and much, much more. The programme is currently available at a super early bird price of £59…and the price goes up on Friday.